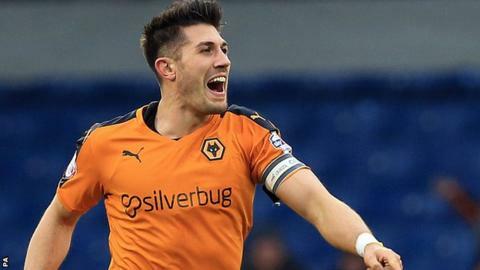 Wolves goalkeeper Carl Ikeme says having a home-grown player such as Danny Batth in the team inspires fans and acts as motivation to the Championship club's young players. "Everyone likes home-grown players in their teams," Ikeme told BBC WM. "I'm not saying a player outside doesn't care as much, it's not that. "But the fans resonate with them a bit more. It gives the fans an identity with the team. They know Danny Batth (from Brierley Hill) is local." Sutton Coldfield-born Nigeria international Ikeme, 29, came through Wolves' academy before breaking into the first team squad in 2003 at the age of 17. "We've had a great academy system since I was young and even before that," he said. "It's always good to get home-grown players. "We always seem to be bringing them through and there's a few more who can come in. It's a good system for the club and long may it continue." Wolves ended Saturday's home game against Blackburn with six academy graduates on the pitch. Ikeme, Batth, Dominic Iorfa, Jack Price were joined by the latest two to make Kenny Jackett's Championship first team - striker Bright Enobakhare, 18, and 19-year-old midfielder Connor Hunte. "They are two really talented lads who've been around the team since the start of the season but they can make a real impact," said Ikeme. "I was speaking to Bright afterwards and telling him to just keep his head down because I want them to fulfil their potential, but they've got to really work hard to be in the first team, rack those appearances up and start influencing games. "Connor came on and looked really good as well. He looked confident, which is the main thing because they're coming on in front of 20,000 fans. "They didn't look out of their depth at all when they came on. It's good they're involved. Maybe the manager will feel he can put them on a bit more with us in mid-table." Enobakhare scored on his debut in the League Cup win against Barnet in August, while former England Under-17 international Hunte's debut as a substitute on 8 March also ended in victory over Bristol City - the last time a Wolves player netted at home. Where have the Molineux goals gone? Wolves have been involved in three successive goalless draws at home - the first time that has happened since 1899. Their sixth goalless stalemate at Molineux this season is also a new post-war club record, while a Wolves striker has not found the net in 10 matches (home or away) since Joe Mason scored at home to Preston on 13 February. However, lost in those scoreless statistics is one that would privately please any head coach and any goalkeeper - three successive home clean sheets. "Obviously it's nice to keep clean sheets," said Ikeme. "You're always happy when you keep one but I'd trade the clean sheets for victories. That's what we want. We're here to win. "We understand that the fans are a bit concerned, but it shows a lot about the spirit of the team that we're still fighting to keep the ball out the net. "Some might say we've got nothing to play for but we're still fighting and trying to improve to take into next season." Carl Ikeme was talking to BBC WM's Steve Hermon.